I wasn't really ready to see my results because i was afraid of seeing the same thing again - disappointment. Last year i scored badly for all my modules. You need 40 to pass. That sums up my horrible exam experience with UOL last year. So this year i really pushed myself to study hard. I changed my learning and studying techniques. I got all first class grades! Don't believe? Ok here's the proof! Side note: I'm selling my FI written essay notes. Sold to anyone who wants to read it. Please scroll to bottom to get more info. Pretty much sums up my pleasantly shocking exam experience this time. I had all As! That huge jump of my grades was unbelievable. I'm so happy right now! Overjoyed. I screamed at 1.30am when i saw the result and my whole family came over to check. Like, is this real? KNOW WHAT YOU ARE STUDYING. You must understand every concept, every detail (especially microeconomics or math related modules) and every other possible questions that you may ask yourself. Lastly practice doing. For essay writing questions, keep practising on finishing within the time limit. We tend to write too much on one question and have no time for other questions. I practised a total of about 30 completed FI essays before my exam day. So basically when i went into the exam hall, it was just like i was practising at home. At ease and at calm. Theory (qualitative) questions need an introduction, body and conclusion. I think this is pretty standard when you need to write an essay. Make sure you have good introduction to summarise what u are going to talk about. Consult the UK revision lecturer if you can write an essay format using passive style (i.e. writing 'i' 'we' in the essay). Your body will need evidence/ readings you read from essential readings and subject guide. Lastly your conclusion must answer the question. Essay should not be about how much you memorise. It should be about using what your studies and answering the question. I did this for my FI and i got 75. Although not the highest, but it is still the basic u need to do if u are aiming for an A. For quantitative questions, our examiner don't like to repeat questions from past year paper. They always come with new questions that u don't see before but with the same concept. So u need to know your concept very well (actually this applies to qualitative questions too) and be able to twist around the concept and apply on the question. Not easy for me because i am not a Math person but definitely fun for me when i practise doing quantitative qns. VOICE RECORD YOUR LECTURE. It works for me. Whenever I'm studying something that i got stuck with, i listen back to the lecture and see if i miss out anything. Where is the exam venue held? In my previous post on UOL, i mentioned that the final exam period is in MAY. Your exam venue will be in SINGAPORE EXPO HALL. Every single student studying the same subject as you will be taking the paper. Rows and rows of chairs and tables will be neatly organised in the big EXPO hall. Everyone will be doing their super last minute memorisation/study. There are prelim exams in SIM before your final exam. Prelim exams are usually held in end of February to Mid March. About two months before your final exam starts. Venue is SIM grand hall. The top level in SIM. Is it compulsory to go for prelim? NO. i didn't attend prelim papers. I don't find it useful, especially when the questions asked in prelim are the recycled past year exam questions. You will get access to all these past year papers in your SIMCONNECT or VLE as well. So no difference. It only gives you a preview of an exam atmosphere. However, still try to attend if it is your first time. Good to know that you won't be alone for revision. SIM and London give you revision before your exam! We call the SIM revision as the local revision where your lecturer give u the class. The London Revision is Overseas UK revision where the lecturers from London will fly to Singapore to give u the revision. UK revision usually starts in March to April. Local revision starts in April. You also choose your UK revision timetable! The UK one is a 2 day revision, 6 hours a day. The local one is also 3 hours revision, for 2 days too. UK revision really helps because those lecturers are usually the ones marking your exam paper! They also know the subject really well and can give you a clearer explanation than some local lecturers (in my opinion). My CF UK professor was freaking awesome. She taught me all the topics within 2 days, 6 hours a day, and she made me understand the whole freaking subject. She just use 12 hours guys!!! If she is my local lecturer, i am very sure i could get an A.
Ok i will end it here. Hope this post helps. Don't give up, not yet! "Be persistent and you will get it. Be consistent and you have it." Hi guys! I'm coming back for an update! I think it will be nice to update what happened after i received my results. So about a month ago, I received an email from school that I was invited to attend the Achiever's Event! I was selected to be one of the 17 students to receive an commendation award. This award is for students who are getting First Class Honour Results and are expected to get a First Class Honour next year. Yeap yeap. I'm one of them :DDDDD. hahahahaha. I was very excited & shocked when i saw the invitation. I quickly called my boyfriend to tell him. My boyfriend was also invited to the Event because he is one of the First Class Honour holder. haha. So both of us attended it. I was just a little disappointed that i didn't receive a Topper email for FI. lol i thought maybe perhaps i might be the top for FI in my school. But well the topper isn't just from Singapore but the whole world. Then ok lor, confirm not me already. It's okay. I only had a few photos. Hope you guys will work hard in UOL and achieve something great too! P/S: If you are curious in anything and if i can help, i will answer your question! feel free to email me at yuenman25@hotmail.com or simply comment down below! If you're interested in buying my written essay notes for FI, please email me. Good luck! Hi, im taking MSM this coming term. Haha. Idk about FM and isorg, u can go to the vle portal, download their subject guide and past yr papers to see if u like the format and materials being studied inside. :) I saw FM's exam qns, i think its quite managable. Hi, its lilibeth :) . Since i only took her lesson, i can't recommend u who is better haha. I wrote my own notes for the exam actually. Different from all the lecturers. Ohh thanks! :) I saw from your prev post that you are selling your own FI notes. Is it still available? 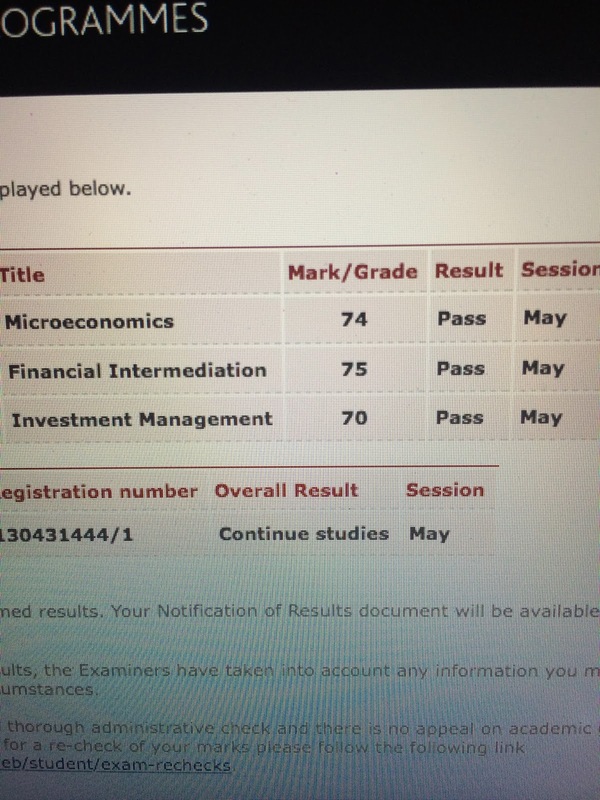 Hi Kacey, congrats on your outstanding results! Just a question, I'll be taking CF and Micro this upcoming year, any intro to which lecturers are good? Hi, thank u :). I had Esther for CF but she was like a bullet train. Talked too fast. haha. Not sure about CF but the paper is managable. Micro - definitely recommend Derek Hui. He is very clear and stresses on important points. Hi, can I ask if you have esther's email? Hi there! Thanks for ur compliment :). I took PBF last year thinking it was super easy because the questions asked were fairly easy (asked u bank run, securitization etc). So i memorised the subject guide & gave wrote them in the ans. End up i only got 43. So, no. if u wanna score. NO COPY PASTE FROM SUBJECT GUIDE. The examiner would want u to write MORE out of the subject guide. For eg the related news articles and your opinions. Its the best to phrase the words in your own words too. If u use google & just searched say 'bank run', u will find alot of info on that. Same goes to credit risk & other topics that u r studying. If ur math is better, attempt the math qns so u r only answering 1 theory qns in ur paper. Hi can I ask if it is possible to go to a local uni like smu if u achieve a first class honors in any bachelor from sim-uol? Hi from what you mentioned,there are no tutorials.Then who can the students approach if they have doubts after the lectures? Hello!I would like to know more about the culture there:).How are the students and lecturers like?Are the exams manageable?Thank you! Oh and just sth I have always been lost.Do u mind sharing ur studying techniques? Hi, our lecturers are all very nice, at least for the lecturers that taught me. But because we don't have lessons in classroom environment style, we won't get to make a lot of friends in UOL (unless u are active in CCA and join the orientation beforehand). Usually we spread our seats around in lecture hall, like spacing ourselves out. Unless u purposely go and sit beside someone and start a conversation, but i hardly see people doing that. The best time to make friends is when everyone is still new in the school. Exams are manageable if you want just a pass :) . If you want a second upper or first class, u need to put extra efforts to do further readings on your own. I think my studying techniques are written in this post already! haha. Basically i record my lecture because i may understand a concept that day but 2 months later i will forget about the whole thing. So i need to listen back to what the lecturer say. Hey, may i know if you have any job offers after you graduate from SIM-UOL? And where are you working now currently? Is it easy to get first class honour for business and management? It is not easy, especially when you have a lot of theory modules. But if you are very smart & can think quickly on spot during exam, then u might be able to get first class even if you don't study hard. haha. To get first class is not super difficult too. Only need 5As. Just practise your questions everyday and u will be fine :). Hi there! You talked about failing a module but you still managed to get a first class degree placement. How does that work? Is there a max no. Of modules that u are "allowed" to fail if you want your first class deg? as long as u get 5 As, u r a first class honour holder. 5As or 4As with a aggregate score of 590 i think. So if u fail, it doesnt mean u won't get first class. :) But if u keep on failing and failing, then in that case i am not sure too. haha. Hello, chanced upon your blog and I picked up a lot of tips, thanks! I'm currently in UOL as well and having my yr 1 exams now. I'm exempted for 2.5 credit modules, but if I still want to get a first class honours, do I have to get 5As as well? Hi, just checking if answers are given for past years exam papers? Hi~ What u see under the commentaries is what u get already. Usually got quantitative question, the steps and answer is given. but for qualitative questions (theory kind), only got comments on the questions. :) but ur lecturer might have gone thru the pyp with u all in class too! u r 3 year path is it? u can choose a minimum of 2 subjects a year or a maximum of 5 subjects a year. does not necessarily need 4 each year. but 4 each year will be the ideal situation. if u say u have 12 full units, then yes there are 12 subjects. if it is 1 half unit, then u need to take another half unit to make it one full unit (i.e. one subject). hope i answered ur qns! Wow! Congrats on your first class grades! I wish I've read your posts about UOL earlier cause it's really useful and helpful! So you will be graduating next year? Can I check what modules you've taken in each year? msm paper was ok right? hope u did well! Hi! I was offered in UOL accountancy and finance. Im still in the midst of contemplating whether to accept the offer or not. because firstly, i have very limited knowledge on accountancy and finance. In fact i never thought that i would have entered this course in the first place. And secondly, i was worried about the difficulty level when we are studying at UOL. any advice how i should go about deciding and reviewing the offer given? What r ur other offers? I didnt have any prior knowledge related to banking & financing before i enter into uol. The things there are actually quite understandable. May sound tough but is actually quite common sense once u get the concept. I would say it is not difficult but if u want to score well, it is difficult because it requires much more effort and reading on ur own (cannot solely depend on lectures). By difficult i mean more readings and if the further readings make u more confuse then u need more readings to clarify ur own doubts. If u have other better universities such as NUS or SMU offering then of cuz would be better. Just finished my last exam for uni :) havent start hunting for a job ! Hi there! I chanced upon your blog as i was searching for people who experienced UOL in SIM. One of my friend told me that if you fail any given one module, you'll lose your "honours" title at the end of 3 years. Is this true? Hi! Hmm i dont think the honours title will be removed. I failed one module too. When i get my result in this August i will update on the blog. haha. Is orientation awkward?I read some online forum mentioning it to be awkward and not fun. i didn't attend the orientation! haha. Also,what are the further readings u refering to in ur reccomendation to read it to get first class honours?Is it advisable to study in the school after lessons? Further readings mean u google the information urself to get more information about the topic that you are studying, because what the teacher teaches is very basic stuff only, especially for Theory modules. It can also be an external readings where u search about the information on the book title/ website link that your subject guide will provide for u. Thanks!! :) I am really worried as I didnt do well for my As.Is there any advice for me? mix with hardworking friends, try to start revising early (like December time u should be revising alr). Anything dunno dont be shy just ask the lecturer. Email him or ask him in class. haha. read more materials especially for theory modules! Hi! Do you know which timeslots are the most popular ones? I think they are the morning and afternoon sessions :) . Hi there! Are you still selling your FI notes? Hi, may I ask you a pbf question? Sorry. i throw back to the teacher already. haha. u can ask ur lecturer! Hiiya! Im a Biz & Mgt student! Is ESAP, EBIZ, MSM, ME a good combination? Im kind of stuck between ME and MA for my Year 2 haha. Wanna know what is your class number for Derek Hui's class for Micro? Hi i actually didnt attend derek hui's class. i view his recorded lecture videos only. I opt for self-study during my micro retake :). If i am not wrong though... it is L42? I mean Derek Hui's recorded lecture! Hi Kacey, I'm in accounting and finance course. May I know if its okay if I'm not getting any textbooks and just study th lecture notes and subject guide for exams? Ya. Don't buy textbooks also can. But if u want to score higher , the textbooks will help u. U can borrow from library and photocopy it. Dun need to buy waste money. Yes please email me thanks . :) under contact me tab. Hi ! im sorry i reply this so late! U just have to understand the concept to draw a graph. If u need help, u can always search on youtube. there r alot of videos teaching econs. Anw i believe ur exam has already ended. Hope u did well! Hi :) I remember the subject guide comes only during Oct-Nov period. I have chosen a POA class taught by Ms Chu Mui Kim.. Any idea whether she is a good/bad lecturer? Just trying my luck here but are u still selling ur fi notes?